Those who lost their limbs in the Boston marathon bombing are finding support among military veterans who have gone through similar things, NBC’s Lester Holt reports. >>> in the aftermath of the boston marathon bombings, doctors were forced to perform amputations on at least 14 patients. many of them are already finding a ready support network among veterans of the past two wars where hidden explosives have taken a devastating toll. wounded warriors who can tell the boston survivors a lot about hope and living a full life. it was not what anyone expected on the streets of america. instantly the fates of ordinary americans horribly maimed by improvised bombs were inextricably linked to wounded american soldiers like calvin todd . >> we were on a mission, foot patrol. >> reporter: todd 's life altering moment happened in afghanistan. >> i stepped on a secondary and lost my lower left leg. >> reporter: now the 26-year-old is on the front lines of a different kind. >> i'm almost back to new. i can run eight-minute miles new. i probably got four or five different feet for different activities. >> reporter: todd is one of nearly 1,600 service members to lose limbs in combat since the start of the war in afghanistan . for many the road to recovery is through here, walter reed medical center in bethesda. doctors say the painful experiences of the battlefield have changed the future for all amputees. >> we have plenty of example of that from our injured service members who have thrived from sudden blast injuries . there's no reason to think the victims in boston won't do the same. >> reporter: the steep learning curve , born of decades of war, have produced advances in bionic hands, knees, ankles, and beyond. >> i can rotate all the way around. 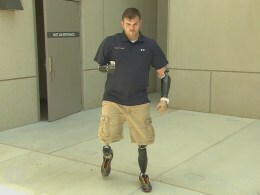 >> reporter: travis mills is 1 of 5 quadruple amputees from both wars. >> i'm very fortunate that the research that has been done has benefited myself through my injuries. i know if i would have got hurt like i did ten years ago i probably wouldn't have made it off the battlefield. >> reporter: there are new approaches to rehabilitation, too, physically and mentally. >> they need to have a good perspective who they are, they have to feel good about themselves. >> know that you just keep moving forward, keep going and we'll get better. >> reporter: calvin only needs to look to his side for inspiration. while the landscape in afghanistan is a long way from boylston street , this war jenn knows what the boston victims have to overcome and what they have to look forward to. >> to get out of bed and start moving, it is going to come back to you quick. there is a lot you can do. the sky's the limit. you can do anything you want to do. just work for it. >> it is important to note some of these incredible advancements in technology can cost tens of thousands of dollars. and while it is uncertain what their insurance providers will cover, the marathon bombing victims will surely have options that would not have been available just a few years ago.